These simple, one-piece spring steel clips easily mount canvas-covered stretcher bars to wooden frames. They require no tools, adhesives or extra connectors. Clip-Its will not damage artwork or frames and they allow for quick and easy removal and remounting of framed artwork. They are also reusable. 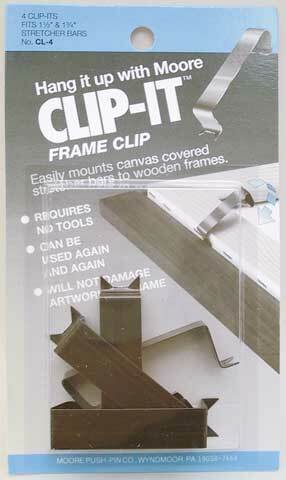 Mini Clip-It frame clips fit 1-1/4" stretcher bars. Standard Clip-It frame clips fit 1-1/2" to 1-3/4" stretcher bars.